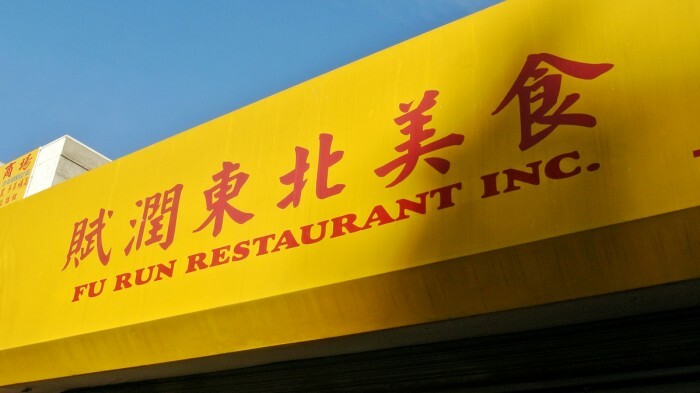 When you think of Chinese food, what comes to mind? Maybe wonton soup? Lo mein? General Tso’s chicken? Dumplings? Maybe even Peking duck? I’m willing to bet you were not thinking of lamb. 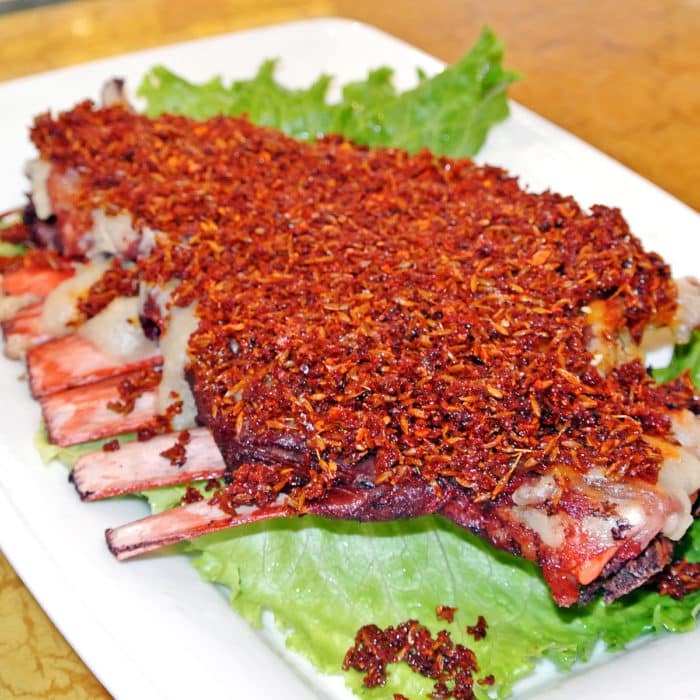 Though you may not realize it, there are a some regions in China that do specialize in lamb and make it quite well. These regions are mostly located near the northern reaches of China with proximity to Mongolia or the Middle East. The lamb is often heavily treated with Middle Eastern spices, especially cumin. On this visit to Flushing, with my friend Harrison in tow, I was questing to sample these unique Chinese cumin spiced versions of lamb. Our first stop, Fu Ran, had been on my todo list for nearly five years. 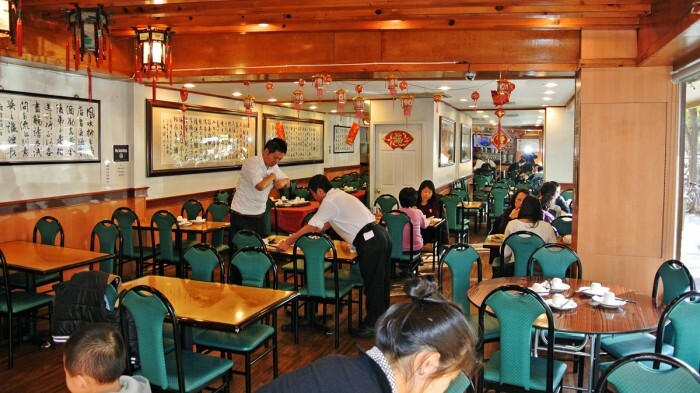 In my opinion, it is one of the nicer sit-down spots in Flushing. 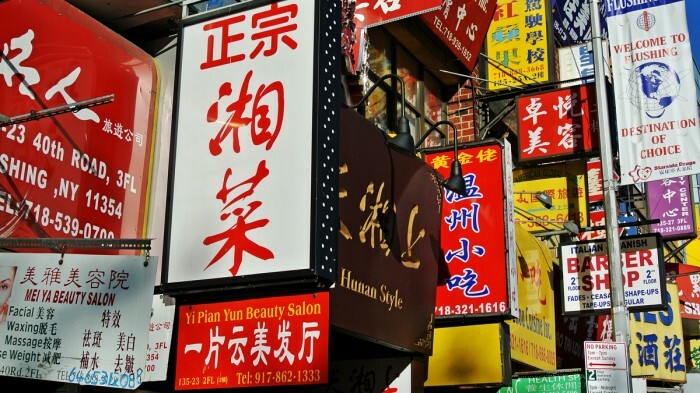 The shop is very clean and the service is attentive. They have received a lot of press for their famed Muslim Lamb Chop and I was finally going to try it myself. I think the reason it’s taken me so long to get around to come to Fu Ran for this dish is because it doesn’t exactly fit into the cheap eating strategy that I usually employ while visiting Flushing. The dish is relatively pricey for Flushing standards at $21.95, but is certainly large enough to fill at least two people. After placing our order and anxiously waiting, the most magnificent looking hunk of lamb arrived at our table. 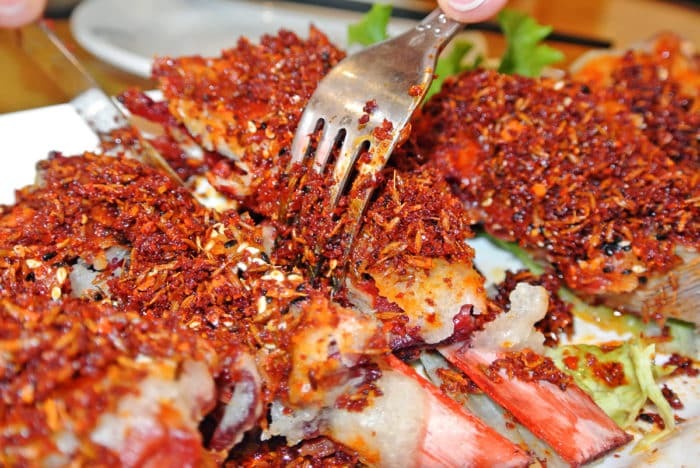 It came completely smothered in whole cumin seeds with chili powder and sesame seeds. The gamey lamb meat was absurdly tender, shredding and sliding off the bones with ease. It was definitely different than I expected and way spicier than I had thought it would be. Just look at that red glow radiating off of the meat. It was also a lot crunchier than I had anticipated. Since the dish was deep fried, the whole cumin seed exterior crackled and crunched with each moist, fatty, meaty, herbal, spicy bite. It’s a really bold, extraordinary dish that I’m so glad I’ve finally had the chance to try for myself. By the way, when the dish came out, one of the servers came over to chop it up for us… with a butter knife. Really, that’s all that’s needed. It’s that tender. Holy cow, I mean lamb. For my other sampling of Chinese style lamb, I headed to the other end of the dining spectrum for some street food. 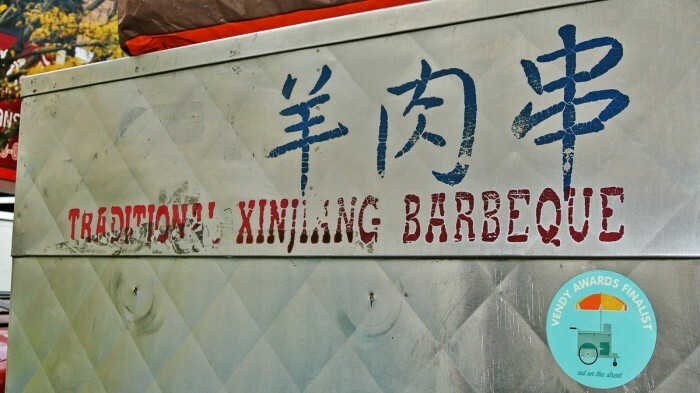 One of my old standbys, the Xinjiang Barbecue Cart, is situated on a heavily trafficked corner of Flushing and has gotten quite a lot of media attention recently. 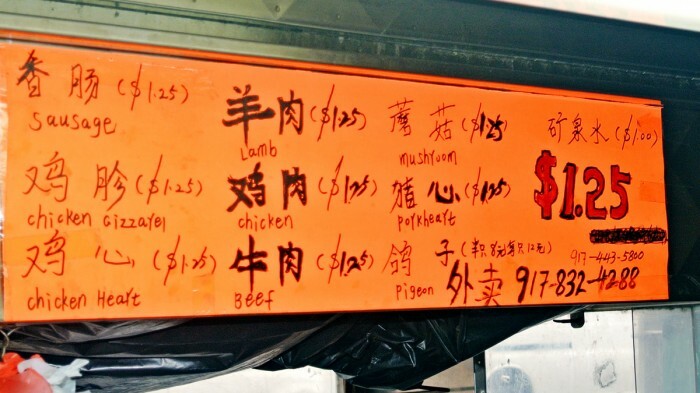 The cart serves up a variety of meat and offal skewers cooked over a hot coal box including lamb skewers. Even the Vendy Awards caught wind of of this cart naming it a 2012 Vendy Awards Finalist along side the many trendier food trucks recognized. On this visit, I noticed that they were offering pigeon and asked for one, but was told it wasn’t available so I stuck with my old love, the spicy lamb skewer. We were on a lamb quest after all. By the way, when asked “Spicy?” your answer should always be a resounding “Yes, spicy!”. 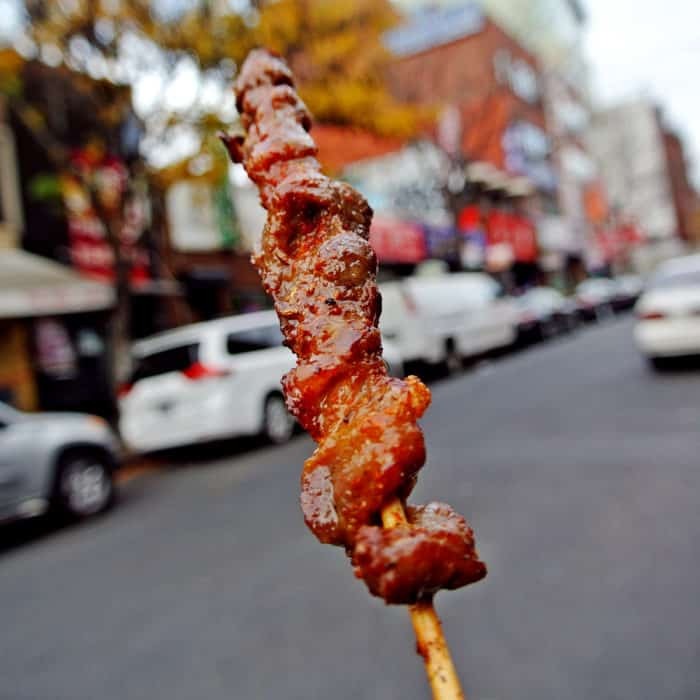 If you do, just before your skewer is done cooking, they’ll squirt a bunch of spicy red pepper sauce onto your skewer adding an incredible burst of flavor to the already delicious meat. 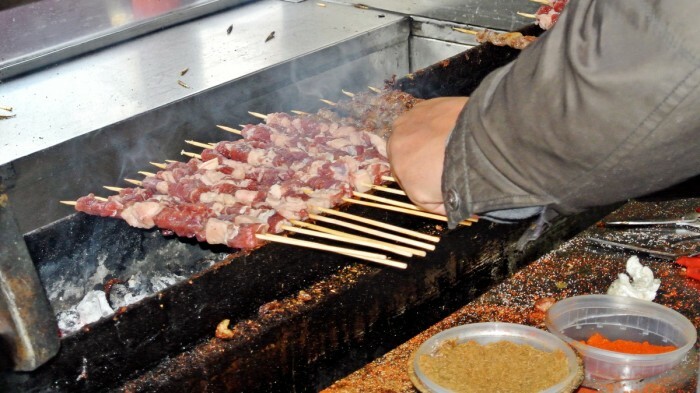 It’s a fairly unnerving process getting the cook’s attention in order to get your skewers thrown onto the hot coal box, but once you do, you’ll be rewarded with extraordinarily tender, spicy, flavorful lamb meat on a stick. Each skewer will cost you just a $1.25 so it’s always a great value. I often find it difficult to order just one! In conclusion, each of these two dishes is really awesome so I’d find it difficult to pick a winner. They are both so incredibly delicious and different from one another, so you should probably just have both! Know any other amazing Chinese lamb dishes I need to try? Let me know in the comments below.